Robert F. Kennedy (RFK) Bronx toll plaza rehabilitation and Manhattan plaza interim repairs is a multi-staged transportation renovation project and one of the final phases of the overall RFK Bridge rehabilitation program. The RFK bridge is located in New York City on Randall's Island, between upper Manhattan and Northern Queens, consisting of two toll plazas and three bridges, which serve as a main artery connecting the boroughs of Manhattan, the Bronx and Queens. The bridges and toll plazas were originally built in the 1930s, using funds from President Roosevelt's New Deal initiative. The project was championed by controversial “master builder” Robert Moses. It was one of the largest infrastructure projects of its time, even larger than the Hoover Dam that was constructed concurrently. Connected to the Manhattan toll plaza stands the iconic Art Deco building that became Moses’ office for the remainder of his career. In 1969, the toll plazas were greatly expanded due to increased traffic; Widening structures were added, nearly tripling the number of toll booths. Today, about 200,000 vehicles pass through the plaza every day. The roadway is elevated on columns above the island. There are two large toll plazas, one 18-lane and the other 16-lane, one serving Manhattan and the other Bronx-Queens traffic. 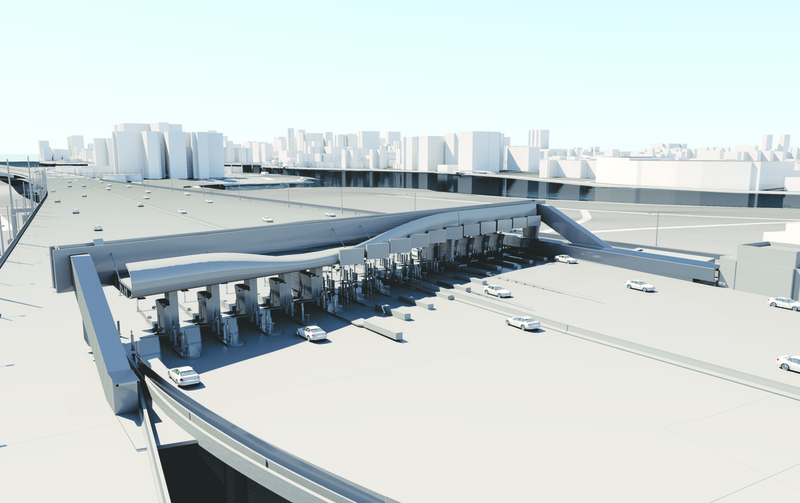 The scope of the RFK Bronx Toll Plaza project consists of the Bronx toll structures and plaza. The project scope includes total replacement of the roadway, including replacement of steel; repair and some replacement of the concrete piers; and replacement of the existing toll booths. The Manhattan plaza portion of the project is much smaller in scope, consisting of repairs of the supporting structure underneath the toll plaza. The project is scheduled to last five years and contains multiple phases, so an acceptable flow of traffic could be maintained throughout the duration of the project. The overall Manhattan plaza is to be replaced as a separate project at a later date. The project to renovate the toll plaza and roadway was programmatically and structurally complex, as it applies 21st century engineering solutions to structures built in the 30s and 60s.